You know you are getting old when you find yourself at a party that revolves around a 4,000-piece world map puzzle. It may sound a little lame, but let me tell you it was a lot of fun. What better way to spend a Wednesday night than with friends, good food, wine, and a giant puzzle? To help out with the event, I promised the host that I would bring dessert. I had planned on making a triple chocolate cake concoction that I have had marked in one of my cookbooks for years, but when I saw the fresh figs at Whole Foods, I immediately changed my game plan. 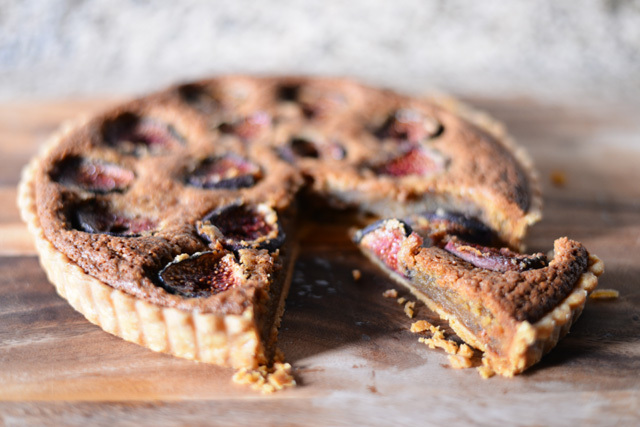 With a basket of beautifully ripe figs and Martha Stewart’s Pies and Tarts book (signed by Martha by the way) at my disposal, this Fresh Fig Tart was born. 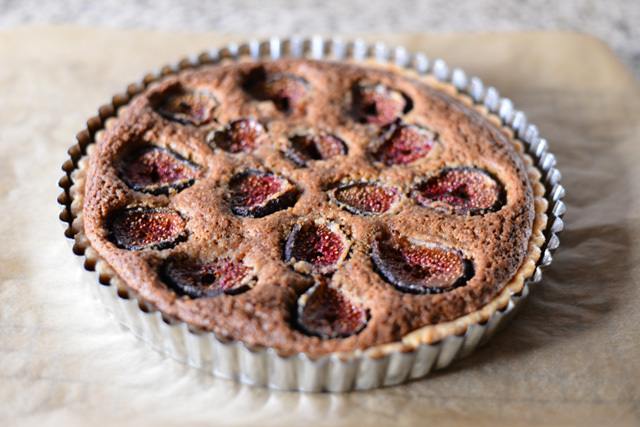 I made a few minor tweaks to the book’s Strawberry and Fresh Fig Tart to accommodate my lack of strawberries and my slightly smaller tart pan, with great results. The figs are really the highlight and treat of the tart, but the filling is spectacular as well. The batter holding the figs in place is made with a mixture of hazelnuts, brown sugar, butter, and Cognac (among other things). It’s similar to a French frangipane batter, which is traditionally made with almonds instead of hazelnuts, and compliments the figs beautifully. Adding a healthy does of vanilla scented whipped cream to each slice of tart doesn’t hurt anything either. Most of the tart was devoured by the end of the evening. I wish I could say that most of the puzzle was competed as well, but we hardly made a dent in it. The original recipe included strawberries and was made as a 10-inch tart. I omitted the strawberries and had no problem fitting the filling in a 9-inch tart shell. If you are worried about the tart overflowing and are using a 9-inch tart shell, reserve a little bit of the hazelnut mixture. On a lightly floured surface, roll out the Pâte Brisée dough until it is about 1/8-inch thick. Lay it over a 9-inch fluted tart pan with a removable bottom and gently fit the dough into the pan without pulling or stretching the dough. Trim any excess dough by rolling a rolling pin over the edges of the pan. Pierce the bottom of the tart shell all over with a fork and then place in the fridge of freezer until firm. Heat the oven to 350 degrees while the tart shell chills. Once firm, line the tart shell with parchment paper and fill it with pie weights (I use dried beans). Bake for 30 minutes, until the shell has set. Then remove the pie weights and parchment paper and bake for another 5 minutes. Set aside on a wire rack and cool completely. In a food processor, pulse the hazelnuts until finely chopped. Add the brown sugar, sugar, salt, and lemon zest, and pulse to combine. Then add the butter, Cognac, eggs, and vanilla, and process until the mixture is almost smooth. Place the tart pan on a rimmed baking sheet. Spread the hazelnut mixture on the bottom of the tart shell, using a palette knife to even out the top. 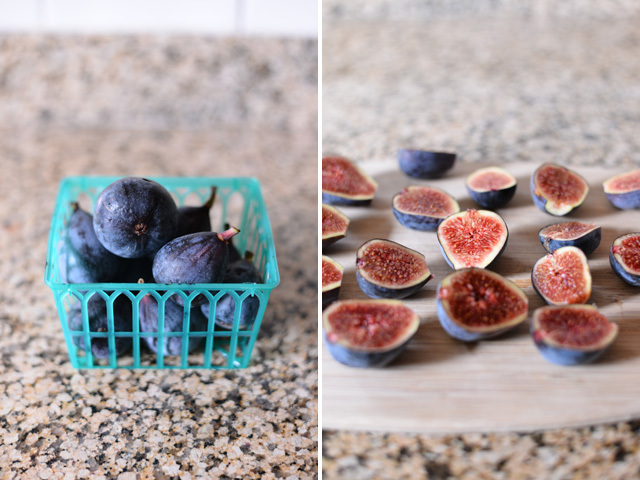 Arrange the fresh figs halves on top and bake at 350 degrees for 30 minutes. Then reduce the heat to 325 degrees and bake until the filling is set and dark brown in color, about another 60 minutes or so. Transfer to a wire rack to cool completely. Serve at room temperature with whipped cream on top. Note: You only need half of this recipe for the tart, so save the other half of dough in your freezer for another day. In a large bowl, beat the cream until soft peaks form. Add the confectioners sugar and vanilla extract, and beat to combine. 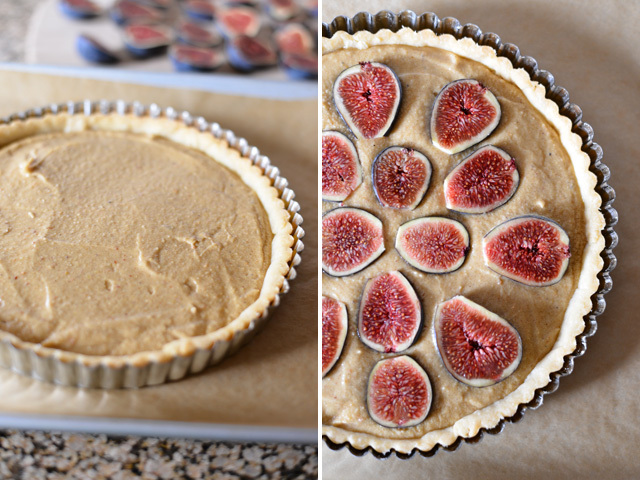 The Fresh Fig Tart is a compelling recipe for the always too short season of figs! Such a lush dessert! Gosh, I haven’t tried to put a puzzle together in years. I might be getting old too because that sounds like fun! This tart looks simply gorgeous. The filling looks just so wonderful.